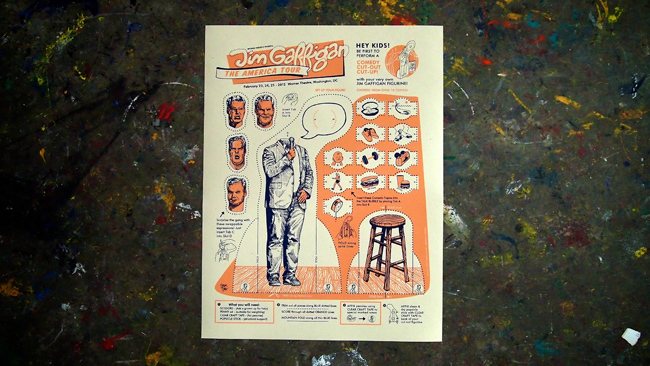 This amazingly delightful poster is promoting Jim Gaffigan's new Comedy Central special being filmed at the Warner Theatre in Washington D.C. T&A came up with an amazing idea for this one we haven't seen yet! This 19"X25" 2-color print was screened on three different colors of French Paper cover stock. We only have one of each color so grab em while you can right here! 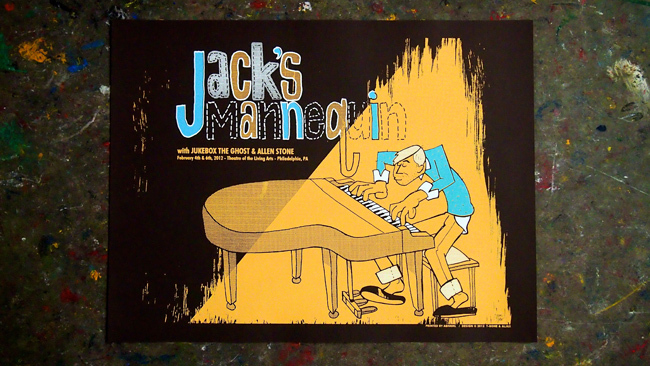 Check out this amazing 3-color print for Jack's Mannequin's performance at the Theater of the Living Arts in Philadelphia, PA. The concert was on February 4th, 2012. The opening acts were Jukebox The Ghost and Allen Stone. The poster was designed by T&A and printed and produced by ABNRML for Live Nation for promotion and a gift to the band. It is a 3-color print screened on dark chocolate 25"X19" French Paper Cover stock. 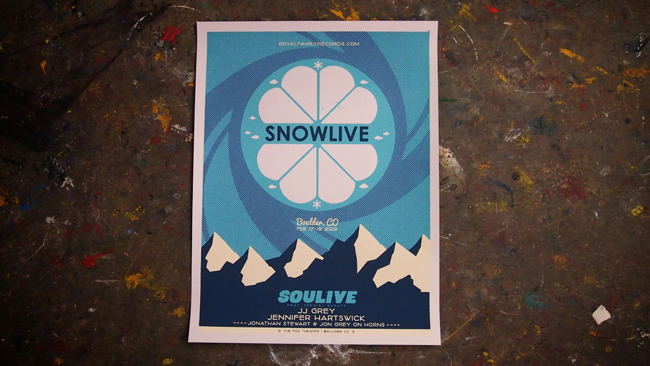 This is the print for Soulive's Snowlive event in Boulder, CO. The event took place on February 17-19th and featured JJ Grey, Jennifer Hartswick and many others. The 5-color design was screened on white 19"X25" French Paper cover stock. A limited number of 60 prints were available at the event. 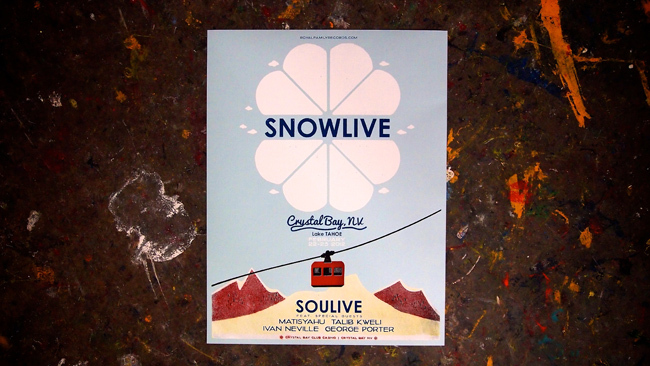 Take a look at the event poster for Soulive's Snowlive show in Crystal Bay, NV at the beautiful Lake Tahoe. The event will feature guest performances by Matisyahu, George Porter and many others. The design was screened with six colors on special 140 pound snowcone green 19"X25" French Paper cover stock. Only 60 of these prints were screened and they were available at the event. ABNRML has partnered up for years with famous Philadelphia artist John Warner to create a library of incredible Phish and Grateful Dead lot t-shirts. 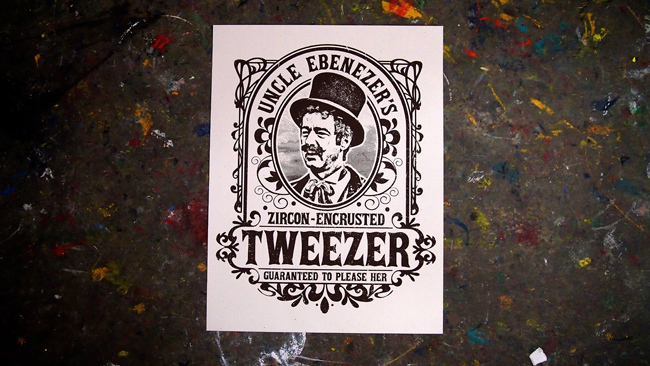 This brand new Tweezer silk screened poster was just added to the mix! This 1-color design is taken from the original Doctor Fluff's Tweezer design and screened with love on 19"X25" cream French Paper cover stock. Pick on up here! 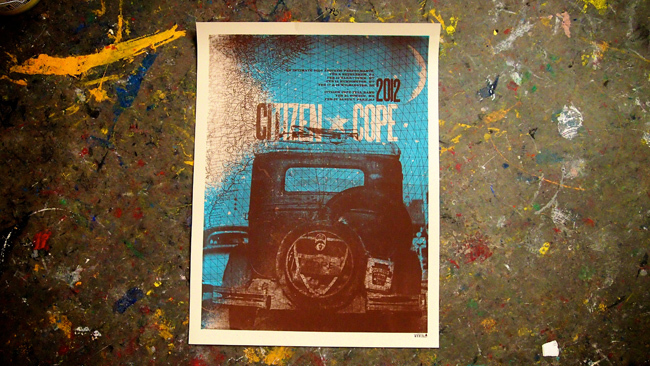 Check out Citizen Cope's tour poster for a slew of East Coast dates. Cope just played some very intimate shows at the brand new Wilmington, DE World Cafe Live venue. This is a 2-color print screened on 19"X25" cream French Paper cover stock. The print was designed by Hypothesis, Inc. and was available during the first section of his east coast dates. A different color variation will be available at his shows soon!